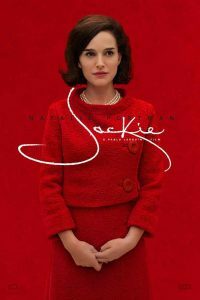 Jackie is an intense portrait of Jacqueline Kennedy in the week after the assassination of her husband, John Fitzgerald Kennedy in Dallas in 1963. Directed by Chilean director Pablo Larraín, it features an excellent performance by Natalie Portman as the grief-stricken First Lady. Larraín uses extreme close-ups of Portman and other actors playing Bobby Kennedy and other members of the Kennedy and Johnson families. It’s an unsettling, yet hypnotic, look at the grief that this very public figure endured. Jackie begins with a journalist arriving at the Kennedy compound in Hyannis, Massachusetts, a week after the assassination. Jackie is subdued, but very much in control of what she wants the journalist to write about her and her late husband. She is very conscious of the legacy she wants to create about the Kennedy Presidency. The image of Camelot comes up frequently in the movie, as some portrayed the Kennedy years as an almost idyllic time. More than once we hear excerpts from the Broadway cast recording of the popular musical. Larraín makes frequent use of the televised 1962 Tour of the White House, in which the First Lady gave the nation a look into the public and private rooms of the house. Using black and white photography to simulate the telecast, and with Portman playing Jackie, these scenes are very effective. In her grief, Jackie is shown wiping blood off her face on Air Force One as Lyndon Johnson prepares to take the Oath of Office. Back in the White House, Jackie wanders through the room of the White House as if in a trance. Even in her shock and grief, Jackie is determined to have the funeral the way she sees fit to preserve the memory of her husband. Jackie models the funeral after that of Abraham Lincoln, almost 100 years before her time. She rejects the advice of Bobby and others to have a smaller, less public funeral, without a procession, fearing for her safety, the safety of the children, and the many dignitaries who will attend. Portman is the center piece of the movie, appearing in almost every scene. She speaks in Jackie’s breathy voice, and portrays her dignity in the midst of such a terrible shock. Yet Jackie is firm in what she wants, and is careful not to let others make decisions for her. Another interesting component of the film are the counseling sessions Jackie has with an unnamed priest during these days. These sessions helped her to deal with her grief during this terrible time for her. The priest is a composite of a few priests from whom Jackie sought spiritual counsel, including Auxiliary Bishop Philip Hannan, who later became Archbishop of New Orleans. Natalie Portman will certainly be a major player in the award season for her amazing performance in Jackie. I also think it could be nominated in such categories as cinematography, costume design, and makeup. Jackie is an engrossing story of a public figure dealing with her own personal grief in one of the most tragic moments of our nation’s history. The “R” rating is the result of a couple of instances of profanity and a graphic scene of the shooting in Dallas.